Toy guns are really attractive toys for kids, especially boys who like to re-enact their favorite heroes or villains from films, tv shows, and video games. There are so many genres or themes which have guns or gun-like weapons as part of the setting and therefore so many toy guns on the market to choose from, how do you know the best for your child? This guide should serve to give you some direction in choosing the best toy gun for the child you have in mind by giving an overlook on the types of toy guns available, their styles and with some reviews of the products in each category presented, so that you can avoid shooting yourself in the foot when making a purchase. Best Toy Guns For Kids Reviewed! You’ll find there is a vast range of toy guns, the suitability of which is somewhat dependant on the age of your child. For instance: a BB gun can be considered a toy gun and will be for the purposes of these reviews but I would not say BB guns are appropriate for a child under the age of 12. 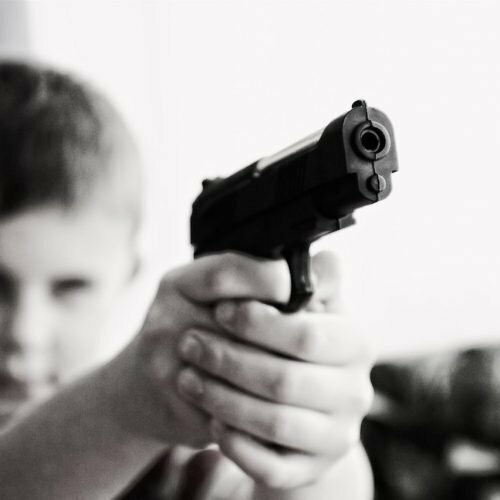 Younger children, however, would have just as much fun with a non-firing plastic gun which the child can use their imagination to play cops and robbers or cowboys and Indians with their friends. A fantastic category to start with for a comparison on the best toy guns is Nerf guns. They are highly popular for kids and adults alike; they really can be a blast, especially in a shooting match with multiple people involved. In fact with nerf guns; the more the merrier! Nerf guns fire foam darts often with a soft rubber tip to add weight to their flight through the air. They often have quite a lot of firepower but really do not hurt at all when you get hit, making them exceptional for just letting loose and letting the darts fly. They are mostly stylised in bright colors and creative designs, some with a revolver style loading chamber, other more like assault rifles and even miniguns! The great variety of nerf guns means the more you have; the more fun it can be, as each child can have their own personal favorite. The Elite Centurian Blaster is a nerf gun in the style of a mounted MG (machine gun) similar to those seen in world war two (more like the BAR) but with a sci-fi twist and colorized brightly to give the impression of this object being pure fantasy and massively fun! Unlike the MG’s that this gun is made to look like, it only fired single bullets at a time so functions more like a marksman’s rifle which is why I would consider this gun more closely to the BAR. There are six darts included with the toy, each of which whistles as they are propelling through the air towards their target; only adding to the excitement that this toy brings. The darts are loaded into an underside magazine which has a 6 dart capacity. This toy gun has great accuracy, with a 100m range, and the removable bipod allows the gun to be mounted on a surface for stabilization when taking a shot or for setting up an ambush! This particular model is fantastic when there are multiple people playing, maybe in a game with two teams or more. A fantastic companion to the Centurian Blaster; this toy SMG (sub-machine gun) is the close range, rapid-fire choice. Playing with the rapid strike is more fun than you can imagine, especially when there is a lot of space where you can hide, sneak up on each other and shoot from behind cover. This model would be much better if there was only a small group of children or just one on their own, it serves as a great personal toy firearm. It also makes an impressive toy to take around a friends house who also has nerf guns. It features an impressive 3 dart per second fire rate, increasing the chances of making a successful shot at shorter ranges. The toy comes with 18 darts, but there is a bundle available which includes a whole bunch more ammunition for the gun and it also comes with a see-through magazine, so that you can always keep track of when its time to reload. For a pistol-shaped option, these alien style toy guns are a great affordable option for those who don’t want to spend as much. There are two blasters included; each has 4 bullets and whats best about this package is that it includes 6 foam cans to be used as targets making it also a great choice as a shared toy if you only have a couple of kids to buy for. Whilst not being the official Nerf brand the plasters still pack enough kick to knock over the targets supplied or to stick to a surface with their suction darts however, unfortunately, there isn’t that same quality and power that the official brand has and this would be all due to the firing mechanism, the materials, and the design that go into the product. Another slight downside to these is that they are very small, and so for older kids and adults its advisable to avoid this option, but for much younger children, it would make a perfectly suitable alternative to the more expensive and maybe even inappropriately powerful options out there. Another alternative to official branded Nerf guns is this Nerf-N-Strike Double Brach Blaster. This model is designed to function and look like a pump action, double-barreled shotgun; the barrels being lined vertically. This option is quite affordable and a lot of fun, its shots pack a punch and the darts fly quite further than expected (up to 27m), it would add some variety to a nerf collection and toy set, giving a powerful close range option. A great feature about this toy gun is that it has a rack on the left side of the shotgun which can hold 4 nerf darts, the other 2 darts that are supplied can be loaded in the barrel which is very convenient. The darts that are included are also whistler darts and so scream as they fly which during a shooting match can intimidate the opponent and really add to the immersion. The toy guns featured in this category do not have any ammunition or firing mechanism, are better for younger children and for their imaginative play, I do not think kids older than 12 would appreciate these toy guns as they lack the excitement firing toy guns provide. This type of toy gun is usually made of plastic and most of the time has a sound effect to give some feedback to the child when they pull the trigger, which supplements the entertainment value. What’s interesting about this toy gun is that it can be used alongside a smartphone by actually connecting the smartphone to a slot on the top of the gun! You can then obtain the AR (augmented reality) game gun app from your respective app store and then the fun ensues. Augmented reality is a game which uses a camera to give an image of the real world but overlays certain game elements which are intractable. ; for example a game which overlays targets to shoot with the gun in the vicinity you point the gun in. The gun does need 2 AAA batteries to operate which is about as much as most toy guns which require batteries. I think its great for the imagination and to really immerse yourself in the fun games which come with the gun and isn’t just a simple case of the child using imaginary targets with a non-firing toy gun. For something that’s more authentic and realistic; the Kadet Trainerifle is a non-firing kiddies toy simulation of an M1903 Springfield bolt action rifle. The bolt and trigger are functioning and does little more than making a click sound so it’s not as exciting as other models out there. However it is quite a sturdy toy which does also have some weight to it and it is quite large, it also comes with a sling to increase its authenticity, it does at a stretch feel somewhat like a decommissioned rifle. I do like the material this toy gun is made from and it is a very interesting choice but for a kid, I wouldn’t say there’s as much fun to be had with this one as others on the market. If you are still interested in an authentic look and feel but would like something exciting, and has sound effects then I would highly recommend this toy shotgun. It’s in the style of a classic single barrel pump action shotgun, which are models mostly used for hunting; this interesting toy has the sound effects of the gun and also some dud cartridges which are ejected from the gun after the trigger is pulled, which is where the authentic feel comes from. This toy includes 4 cartridges that load into, and eject from the gun and also comes in the standard realistic color as shown above or it comes in pink for the little girl hunter to add a bit of flair to the toybox. This toy gun is a lot of fun and younger kids will love the feel of it, the sound effects and the unique cartridge eject feature. It’s called a friction gun as its sound effects are made by pulling back a lever on the side of the gun and as the trigger is pulled the action releases, creating a loud clicking sound. It’s quite an intense sound and can get annoying but its fun for short bursts of play. This type of toy gun is commonly found in most toy stores, it’s very affordable, looks cool and most importantly kids love it for the simple reason is that the toy itself is simple! No batteries required, no need for flashing lights just some imagination required. It’s also very light and not too big, but it can be quite fragile as its made of a fairly weak plastic, especially the tip of the barrel. It has a non-functioning sight attached to the top too to make it seem more realistic. Cap guns are a classic, age-old toy gun which uses a blasting cap filled with particular chemicals which are sensitive to sudden shocks, such as that produced by the hammer on a cap gun. When the percussion cap is struck, it makes a loud bang followed by smoke which is really satisfactory and huge amounts of fun. Cap guns are not really recommended for really young children, not only are the disposable rings of caps a choking hazard, but the sound experience could be startling for them. Cap guns are usually metal in the area where the caps are loaded and struck, and also usually have an authentic design. These simplistic couple of revolvers are also a common toy found in toyshops and are super affordable. There’s not much to them; both the guns are exactly the same, they take 8 ring caps which are loaded into the revolving chamber. It has a similar firing mechanism to a real revolver in that the hammer is controlled by the trigger which strikes the cap, makes the sound and the smoke. As far as excitement goes, they are definitely as fun as nerf guns, and I think they owe this to their bland and unassuming design more than anything. They still can provide some entertainment for a couple of children for a while and they are really small and so super portable, can be taken out and about without any issue at all, so if your kids like to go and play at a friends house, this would be an easy choice. This cool looking cap gun rifle is certainly a great toy for the wannabe cowboy. It really matches the style and aesthetic of the wild west. Exactly similar to the revolvers in the previous review in the way that it loads and functions, but just the look and feel of the gun in its design can greatly affect how fun it is, as this is the best toy cap gun when it comes to enjoyability. This toy gun is a bit more to handle than the standard revolver pistol design and comes with a sling, so it can be carried over the shoulder when not firing, and it is also a great safety element. It’s important to note that the manufacturer does not recommend it for children under 5 years old. It’s also disappointing to note that the gun does not come with caps supplied so they would need to be purchased separately. The most exciting of the cap gun reviews, this cap gun is supposed to simulate a machine pistol in aesthetic, but like the other guns, it only fires one shot at a time. The loading and firing mechanisms being exactly the same as the other two guns. This toy gun is a bit more brightly colored though, and is not as bulky as the rifle and so is easier and more fun to run around with. It is quite generous that the manufacturer included a good amount of caps with this gun, making it the best value cap gun out of those I have reviewed. Squirters guns are the best fun; mostly for the summer but on hot days, kids and adults alike love a good water fight. Its a great family bonding experience, and gives the kids a chance to run around and make the most of the sun with their friends and family. The quality range with squirter guns are highly variable, some are cheap and not very durable, but good if the kids are not going to use them as much and then as the price tag rises, you’ll find the quality of the water pistols does too! With this first squirter gun review, we’ll be keeping things simple with this toy. In this pack, you get 2 small, funky shark design squirter guns which genuinely do look fun, and they are! They are very inexpensive and that does stand to reason; they do have a low capacity and not much power, but they’re a great additional toy to have for younger kids in the bath and for all at a pool party! Other than that, there’s not really much to say, you really get what you see with these super cute shark soakers. Well, they’re hardly soakers emitting only a small stream from the jolly shark’s mouth but they are indeed a charming toy. Continuing on the theme of funky designs; this army style backpack and squirter gun is definitely a great choice for the kid who favors endurance in a water fight. The backpack tank contains 110.90fl-oz of water which isn’t too heavy but a great capacity which in terms of a water fight would greatly help you outgun your friends. Not only is it a large capacity squirter gun but it also packs quite a punch with the distance and power it produces with its squirt apparently reaching 20 feet, a sure fire way to win a water fight. Definitely would suit other military-style kids clothes or kids army guns as an outfit for a BBQ or birthday party. As far as having a good balance between power, capacity, and maneuverability, the Clovertale Water Guns are by far the best squirter gun of those I have reviewed. These water cannons can be charged via the pump, once the maximum strength is reached, the blast is extreme! Definitely a winner at a water fight. It’s awesome that you receive two per pack making these great value and making them great for 2 children or having a spare for a friend or when someone comes to visit. It’s not exactly an officially branded super soaker though, and so it’s not of the highest quality but it still seems durable enough to last. Hopefully, after having a look through this guide you have a better idea of what kind of toy guns there are out there and its worth having a look for yourself in the category you want, but I’m sure your purchase will provide bundles of fun!